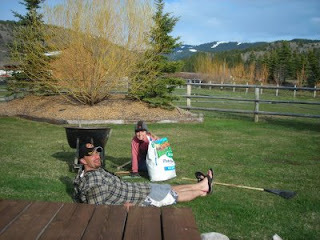 It had been a long time since the sun shined in Driggs, and even longer since I'd seen my old college buddy Tom. Both arrived last weekend, and it was good. There's never a boring minute with Tom around, and the fun seems to just naturally follow him everywhere...like from California to Chile on a solo motorcycle trip, or up Kilimanjaro, or surfing in Fiji. 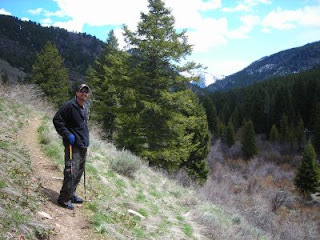 Our hike up Moose Creek & Plummer Canyon on Saturday paled in comparison to those epics, but was still a good day. It was great catching up with an old friend. Tom and I are different in a lot of ways, but brothers at heart. We've got each other's back, and lots of stories from back in the day. 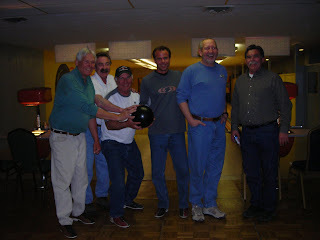 After Tom headed on down the road, it was time for the annual bowling event with my basketball team in Jackson. These are some of the best dudes you will ever meet, and a few of them have been playing b-ball together for over 30 years now (I've been running with them for 13 years already). I've probably only bowled six times in the last five years, but I took no prisoners on Friday, bowled an all-time personal best 211 (sometimes the pins just keep falling down), and took their money. If we had a bowling alley in Driggs I could really have some fun. 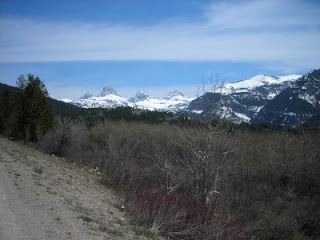 Sunny spring weekends in Teton Valley wouldn't be complete without a good bike ride. So, I spun around the valley and up to Grand Targhee on the Tarmac...felt great to be out in shorts at last. As you can see from this pic, the Aspen leaves still aren't out, and it's the middle of May. It was a long winter, indeed.